When Alice was a teenager strange things started happening to her. Hours of her life disappeared. She heard voices shouting at her, telling her she was useless, a failure. In her dreams she watched a girl being sexually abused and awoke pleased that she wasn't that girl, curious who she was, and why these dreams haunted her. As she grew older the dreams grew more shocking, more detailed, more real. Staring at herself in the mirror she'd catch her face changing like a rubber mask and would see someone else staring out from her eyes. Today I'm Alice describes the extraordinary journey of a teenager drowning the voices with alcohol, battling anorexia and OCD, to a young woman slowly losing control to 'the children' growing from voices in her head to full-blown personalities. Alice suffered the despotic regimes of the psychiatric wards as she slipped further into mental illness until she was finally diagnosed with multiple personality disorder. When her 'alters' were revealed in therapy she discovered how each one had their own memories of abuse and a full picture of her childhood finally emerged. Moving, ultimately inspiring, this memoir written with Clifford Thurlow is a gripping account of a rare condition, and the remarkable story of a courageous woman's battle for sanity. Alice Jamieson received a 1st class honours degree in Health and Community Studies while suffering from multiple personality disorder and was unable to complete her planned PhD.A marathon runner, breaking the 4 hour barrier; a regular traveller in the Middle East and a qualified gym instructor, she is planning to start a new PhD course at the University of Birmingham in the field of self-harm and dissociation. "Today I’m Alice diverges from the popular “misery lit” genre; it is an intelligent, analytical first-hand account of mental illness, written by a remarkable woman still learning to live with herself." "This is a remarkably lucid account of a life that has been fractured by multiple personality disorder… This isn't a misery memoir but an account of mental illness that's so beautifully written it reminded me of Sylvia Plath's The Bell Jar. Jamieson survived 100 overdoses, alcoholism and cocaine addiction to find love with a church warden.You won't be able to get her story out of your head… You won’t be able to get her story out of your head." ".. a compelling account of the strategies she has used to survive more than two decades of grotesque sexual, physical and emotional harm. 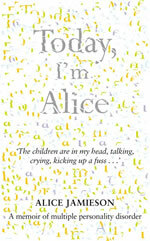 It is not comfortable reading but it does offer insight into a form of mental illness that is more pervasive than we may realise"
"Today I’m Alice is the first major British book covering the subject of Multiple Personality Disorder / Dissociative Identity Disorder and childhood trauma, written by a survivor. It provides a unique insight into the complex world of living as a ‘multiple’ and is a book every mental health worker should read as this condition is rarely understood or appropriately treated within Mental Health Services..."
"…a harrowing account of childhood and subsequent battles with addiction and severe mental illness as a result of abuse…describes how multiple personality disorder develops as a direct result of repeated childhood trauma and allows a child to detach itself from a catastrophic event by creating other personas. In adulthood, these alternative personas or ‘alters’ become distinct personalities and the sufferer may have no awareness of what is happening when one takes control." "Moving and ultimately inspiring, this is a gripping account of a rare condition, and the remarkable story of a courageous woman." "This powerful and compelling memoir about living with multiple personality disorder is the first of its kind in the UK. Written in the first-person, it charts the life of Alice who, after being abused as a child, created multiple personalities to hide behind. " "The harrowing tale of Alice Jamieson's mental breakdown plunges boldly into the controversy over Multiple Personality Disorder (now called Dissociative Identity Disorder) and recovered memories. The author's co-writer, Clifford Thurlow, more than meets the challenge of crafting a coherent story without telling it in chronological order. Instead, the unraveling of Alice's mind is revealed in flashes of memory and schizoid losses of time. The story unfolds much as it might have inside Alice's head, with growing horror as details pile on details. Her attempts to escape the mental torture through alcohol and drug abuse only add to her disintegration. Anyone who found the famous cases of Sybil and Billy Milligan fascinating will appreciate Alice's classic symptoms, which reassert the frightening range of possibilities inherent in mental illness." "I heard Alice Jamieson interviewed on Radio 4, and found myself choosing this book on Amazon as a 'must read' oddball choice. It took me months to start it, but once I did, I didn't stop. Now I find myself almost unable describe the book, other than to say its beautifully written and compelling."